While I have to admit that I am a bit skeptical about the reliability of the results of a recent study from the Sifa University, Faculty of Health Sciences in Turkey, I cannot ignore that Meltem Yaman Onmus, Elif Cakirca Avcu, and Ali Saklamaz claim that "people who cannot lose weight by low-calorie diet can lose weight and fat with elimination diet according to the results of FI [food intolerance] test. FIED [FI elimination diet] is also significantly effective in triglyceride levels" (Onmus. 2016). I know that sounds as if it was taken from the latest unreferenced blogpost on a dubious website, but let's not judge prematurely and instead take a closer look at the design and results of the study. 82 patients (24 male, 58 female) were included in the study. The mean age was 42.04±11.81 (18-65 years). All of them were "unable to lose weight", i.e. patients who said of themselves that they couldn’t lose weight by diet programs and who had a positive reaction to at least one nutrient in food intolerance test and a BMI value ≥ 25kg/m² - in other words: the subjects were the average Internet bullet-in board dwellers searching for the "magic key" to weight loss. This is obviously an important fact, because it increases the significance of the study for said group of subjects. Whether the results are significant for anyone else, though, is questionable, since patients who had no food reaction in food intolerance test were excluded from the study. The same goes for subjects who had chronic diseases like diabetes mellitus, coronary heart disease, renal diseases, etc., or individuals who use(d) weight loss drugs and who had allergy to any drug or food and who overuse medications or have pure menstrual migraine or headache that associated a disorder. No health benefits from "eliminating" foods: Interestingly, the food intolerance elimination diet failed to do what its proponents say it's actually doing: Improve the subjects health. With the exception of a statistically significant decrease in triglyceride levels, there was no improvement in health markers (fasting blood glucose, A1C, total cholesterol, HDL-cholesterol, LDL-cholesterol, AST, and ALT) the scientists didn't observe in the control group, too. As you can see in Figure 1, this particular group of subjects saw significant benefits from following a diet that did not allow the subjects to consume any of the foods to which they showed an IgG response in the previously conducted food intolerance test for 6 months. Otherwise, the diets of the elimination diet (ED) and control diet were personalized diets with "identical" (according to the size, weight, physical activity, dietary habits and socioeconomic status) energy content. 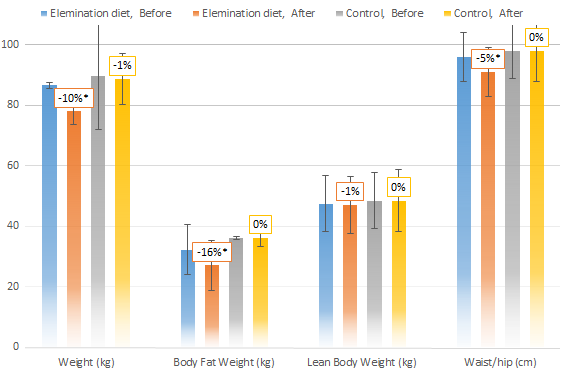 Figure 1: Pre- and post-intervention weight, body fat, lean body mass, and waist / hip ratio (x10); * indicates significant inter-group difference, this means that everything, but the effect on lean mass was sign. more pronounced in the ED group. Against that background it is unquestionably striking that the subjects in the elimination diet group lost 16% body fat, while the control group didn't lose either significant amounts of fat or weight. Now, the obvious question is: "Which foods were eliminated?" Unfortunately, this question is neither answered in the study at hand, nor in previous studies showing that elimination diets reduce also reflux disease, chronic fatigue syndrome, and headaches (Selvin. 2007; Akmal. 2009). Unlike Onmus et al., Akmal et al. 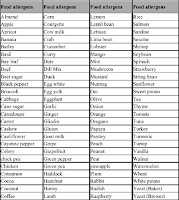 publish-ed a list of allergens their IgG test could supposedly identify. 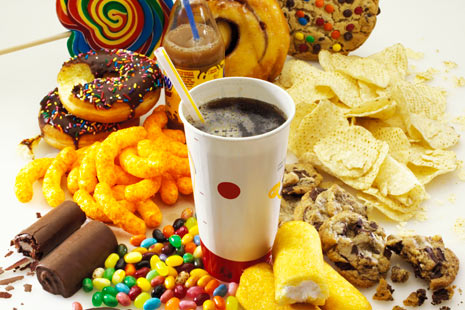 A list eliminated foods is yet missing from study, too. 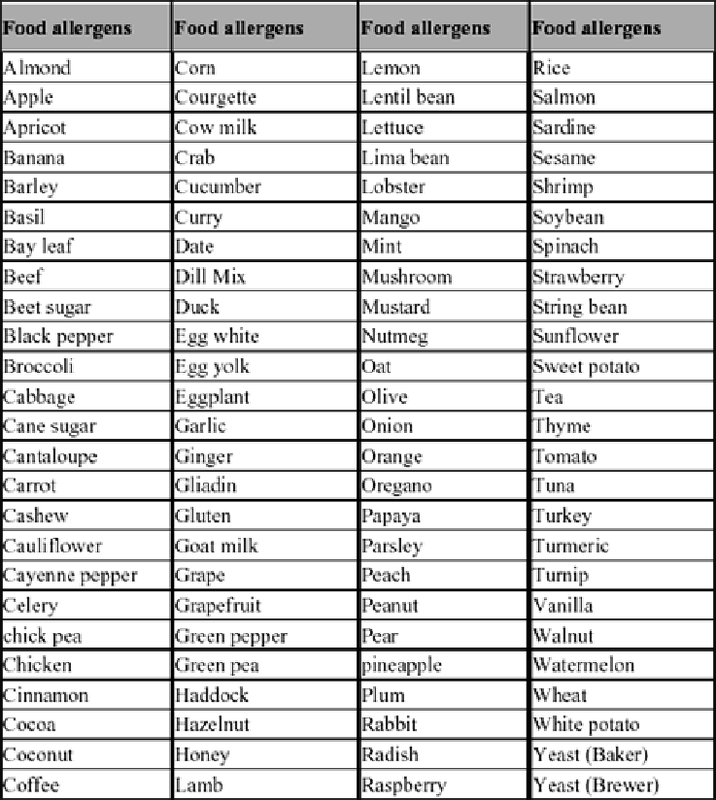 Why's it a problem that we don't know which foods were eliminated? Actually, the answer to this question should be obvious. Let's assume you're "allergic" to sugar, alcohol and high omega-6 vegetable oils like soybean oil. Would you be surprised if you lost significant amounts of body fat if you dropped all sugary and pro-inflammatory high omega-6 foods and stopped drinking alcohol? I, for my part, wouldn't and I guess you wouldn't and you certainly shouldn't be surprised either. Accordingly, the study at hand does unfortunately not provide enough information to decide whether it provides convincing evidence of using IgG-tests to guide you when you're designing diets for yourself or your clients. Hopefully future research will do just that | Comment! Akmal, Mohammed, Saeed Ahmed Khan, and Abdul Qayyum Khan. "The Effect of the ALCAT Test diet therapy for food sensitivity in patient’s with obesity." Middle East Journal of Family Medicine 7.3 (2009). Onmus, Meltem Yaman, Elif Cakirca Avcu, and Ali Saklamaz. "The Effect of Elimination Diet on Weight and Metabolic Parameters of Overweight or Obese Patients Who Have Food Intolerance." Journal of Food and Nutrition Research 4.1 (2016): 1-5. Selvin, E., Paynter, N. P., Earlinger T. P. "Nutrition and allergy." Arch Intern Med, 167.1 (2007): 31-39.